AUEET 2018 Results/ Rank Cards announced on May 12 and check them now: Notification for AUCET/AUEET-2018 has been issued on 03-03-2018 and application registration process commenced from 08-03.2018 and completed on 25-04-2018 and The entrance test is scheduled during 8th & 9th May, 2018. The Directorate of Admissions at Andhra University, Visakhapatnam has released the admit card for the Andhra University Engineering Entrance Test (AUEET) 2018. Candidates who are seeking admission to engineering courses in the state can download the hall tickets from the official website of the examination. www.andhrauniversity.edu.in/doa from 29.04.2018 onwards. Physically challenged candidates, who require a scribe should inform the chief superintendent of the centre for a scribe at least one day in advance. Candidates can make corrections in their names, reservation category, etc in nominal rolls which will be incorporated in the original data subsequently. Candidates should be present one hour before at the examination centre and they will not be allowed once the test is commenced. Candidates are requested to take care and co-operate in this regard. The admit cards for AUCET 2018 have also been released by the Directorate and are available on the official website. This year there are 22,948 applicants for both AUEET and AUCET. The examinations will be held on May 8 and 9, 2018. The exams will be conducted at centres in Visakhapatnam, Srikakulam, Vizianagaram, Kakinada, Rajahmundry, Eluru, Vijayawada and Guntur. The exams for Life Sciences, Humanities and Social Sciences, English, 6-Year Integrated (BTech + MTech) Dual Degree Programmes will be held on May 8 and the exams for Chemical Sciences, Mathematical Sciences, Physical Sciences, Geology and Telugu will be held on May 9, 2018. Around 26,000 candidates will attend AUCET 2018/AUEET 2018, which is scheduled to be conducted on May 8 and 9, in three sessions per day. 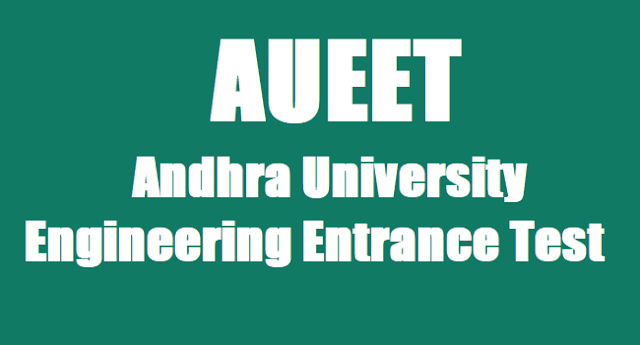 Andhra University EET Examination would be conducted at eight places in the city, for which all necessary arrangements had been made. As per the AU authorities, 23,086 candidates have applied for various PG courses and 2,686 applied for six-year integrated (B.Tech. + M.Tech) Dual Degree Programmes offered by AU College of Engineering (A) and College of Engineering for Women, Andhra University. More than 80 per cent of candidates had already downloaded their hall tickets. Differently abled candidates, who need a scribe should inform the chief superintendent of the centre at least a day in advance according to AU Officials. Candidates can make corrections in their names and reservation category in nominal rolls which will be incorporated in the original data subsequently, he added. VC also instructed that candidates should be present an hour before at the examination centre and they will not be allowed once the test commences. Date & Day 9.00-10.30 A.M. 11.30-1.00 P.M. 2.30-4.00 P.M.
1. Go to the official website for the examination (audoa.in or andhrauniversity.edu.in/doa). 2. On the left side of the screen, click on the tab that says “Download Hall Ticket”. 3. Enter your application number and date of birth in the fields provided and click on submit. 4. Download your admit card and take a print out of the same for further reference. The Directorate of Admissions at Andhra University, Visakhapatnam, has declared the results for the Andhra University Engineering Entrance Test (AUEET) 2018. Candidates who have appeared for this entrance can check their results from the official website. The AUEET 2018 examinations were held in May 8 and 9, 2018 and the results are available for the Six Year Integrated Dual Degree Programmes for the combined courses of BTech and MTech. This year there are 22,948 applicants for both AUEET and AUCET. This year, the first rank has been bagged by Kadambala Yogesh, from Srikakulam, who scored 79 marks. He is closely followed by Kethanapalli Gayatri who scored 78 marks and Berala Mohan Gopinath who scored 77 marks, at the second and third ranks respectively. Steps to check AUCET 2018 results: Go to the official website of Andhra University (andhrauniversity.edu.in). ; Follow the link to the Directorate of Admissions. ; Click on the notification for “AUCET-2018 :: Test Result”. ; Scroll through the PDF provided and look for your roll number. Use ctrl + F to make your search easier. ; Download your results and take a print out of the same for further reference. 2. On the left side of the screen, click on the tab that says “Results”. 4. Download your Result and take a print out of the same for further reference.